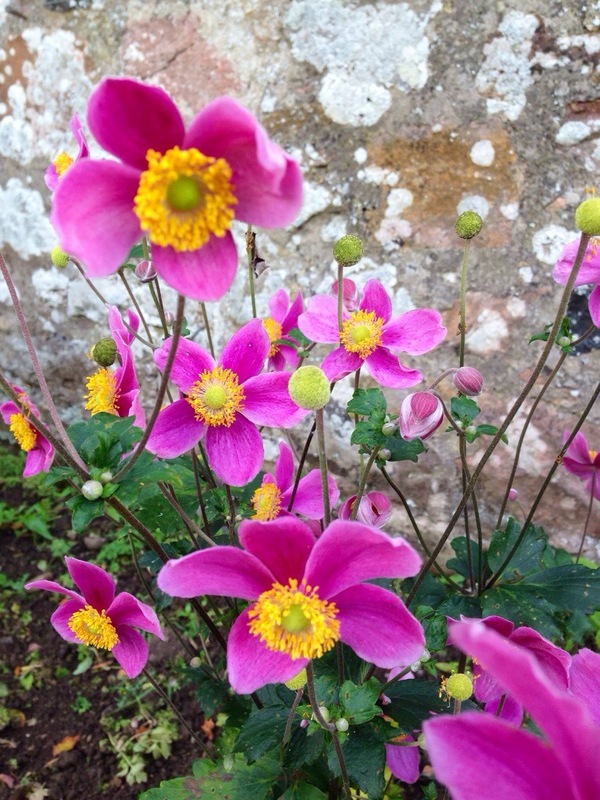 A very Happy New Year to you from the Scottish Country Garden! 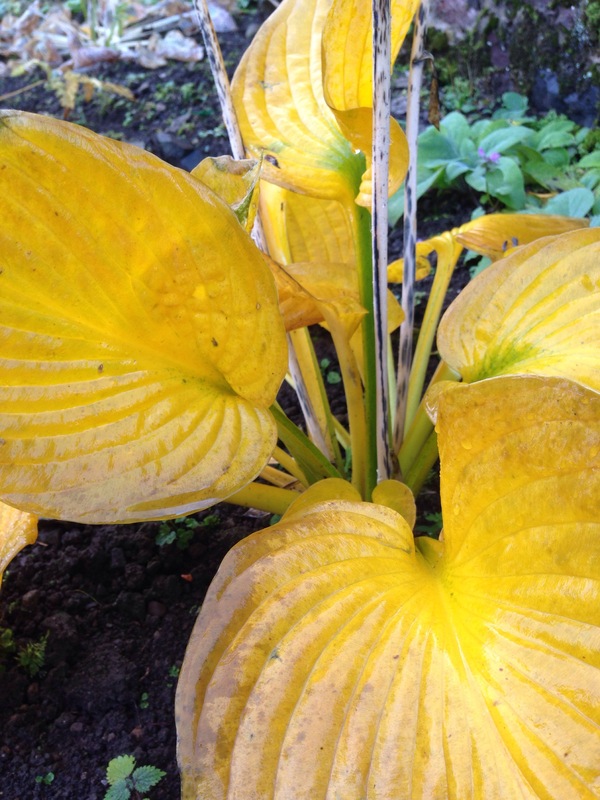 I hope that 2015 presents an even better gardening year for you than 2014! This year, we put in a few plants near the gates, but outside the rabbit-free world of the Walled Garden. To the right of the gates before you enter the Garden is a smallish bed, which has always been a little, well, disappointing, with dusty soil attempting to support a few random daffodils. It is sheltered by a stone wall on the east side and the gable-end of the house on the south side. 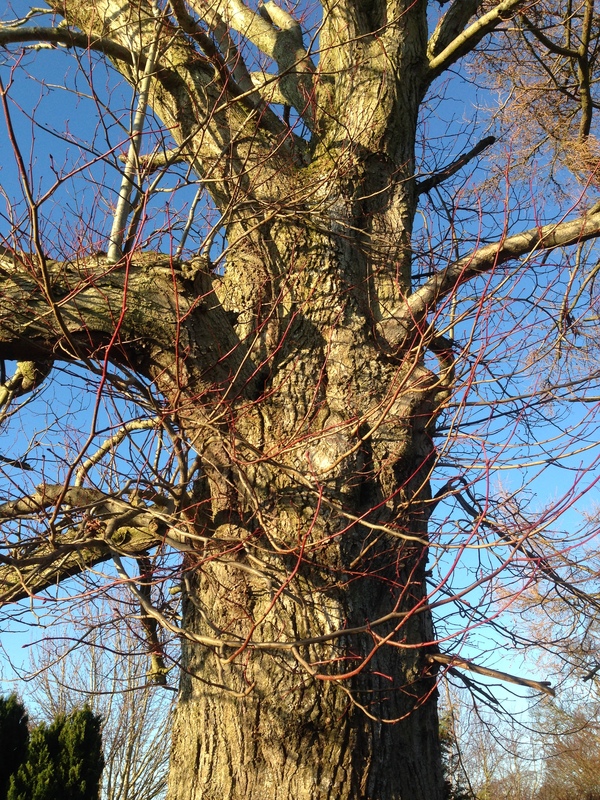 It is also shaded by one of our sentinel Lime (Tilia) trees, so it is a challenging space! 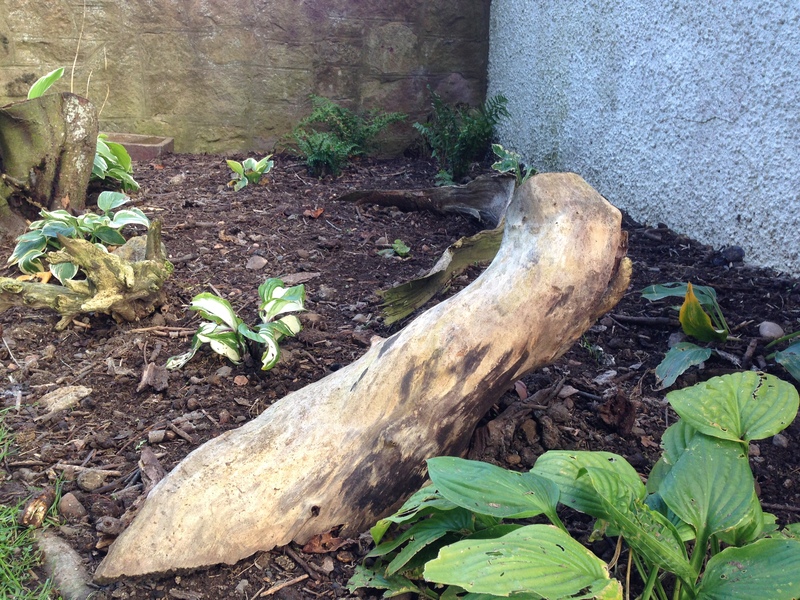 After several preparatory barrow-loads of home-made compost, saying farewell to the dust, we planted the area with several varieties of Hostas and ferns, decorating the area with one or two interesting pieces of wood foraged from the woods. Not quite a ‘stumpery’ in the Victorian sense, as recently brought back into fashion by HRH Prince Charles at his Highgrove garden but echoing the Woodland on the other side of the drive. 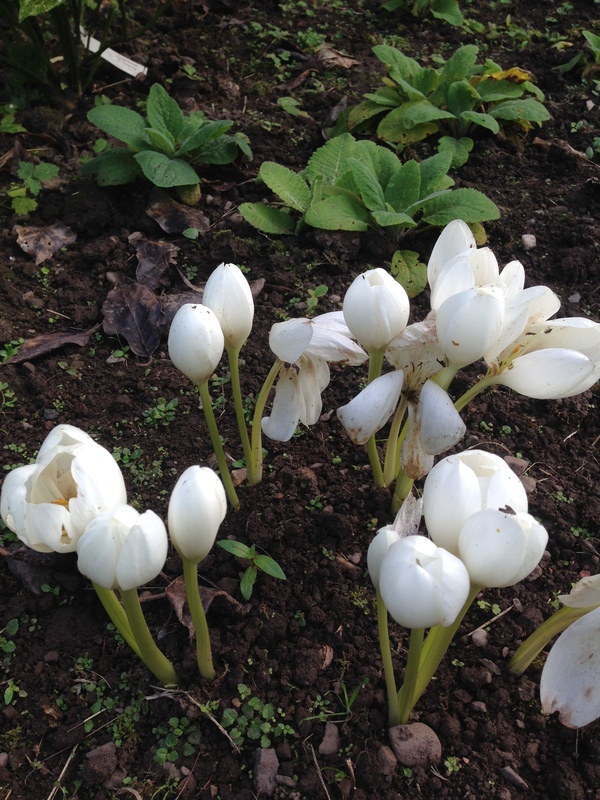 Colchicum album in the Shade Border this year, successfully transplanted! I knew that the Hostas were likely to be safe from the local rabbit population (they don’t like the sap) but was less sure about the ferns. We do have some native species (Polystichum) growing in the Woodland but they are of a different variety. I did though want some winter interest so decided to take a chance on four Dryopteris species (affinis, affinis ‘Cristata The King’, affinis ‘Pinderi’ and carthusiana) all species that can cope with drier shade, and which are evergreen. So far, they have remained free of the bunnies’ attention, as have the new hosta varieties: Aristocrat, Brim Cup, Fire and Ice, June, Liberty, Devon Blue and Orange Marmalade. While the Hostas won’t appear until April/May, the aforementioned random daffodils, boosted by the 4 inches of new compost, should get things of to a good start in March or so. The Hostas and ferns were sourced from Long Acre Plants in Somerset, England. They specialise in plants for shade and supplied many of the plants for our north-facing shade border in the Walled Garden, which we planted up three years ago, all of which have thrived and are starting to knit together nicely. Round the corner from this new bed and facing west is another border which was in some need of attention and which only had some rather scrubby Feverfew growing there. Again, there are no defences against rabbits here and I did want to try to avoid putting up wire mesh as this is an ugly option. By way of an experiment, I planted the area with varieties reputed to be unpopular with rabbits. I had to accept of course that the rabbits were unlikely to have done the same research as I had, and therefore there was a distinct possibility that local tastes might prevail. Four months in, some of the plants, at least, are proving rabbit-resistant: Bergenia cordifolia ‘Winterglut’, Phormium ‘Yellow Wave’, Schizostylis ‘Pink Princess’ (possibly wrongly labled as it appears to be producing pure white blooms even now in December) and Kniphofia ‘Flamenco’ have all remained largely untouched apart from the occasional chewed leaf! Iris ‘Blue Shimmer’ (a Dutch Iris) will also be fine although this looks a little bedraggled as Irises tend to do over winter. Interestingly, the Japanese Anemones x hybrid ‘Queen Charlotte’ (pink, semi-double) and Whirlwind (white) have fared less well, having been chopped back to ground level, despite us having other Japanese anemones flourishing further along, again unprotected from rabbits; I’m hopeful, though, that they will come away alright in the spring as some leaves have returned since the initial attack! Two species of Geranium have received similar treatment – ‘Johnson’s Blue’ and ‘Samobor’(deep purple flowers with patterned foliage) as have Sedum ‘Gooseberry Fool’ and Verbascum ‘Pink Petticoats’. Sedums and geraniums we have growing elsewhere, also accessible to the rabbits, so I am hopeful that at least some of these new plants will re-emerge in the spring with sufficient vigour to out-do them! Time, aided perhaps by a handful or two of pelleted chicken manure, will tell!